A place where you can find culture, tradition, nature, culinary delights and just beautiful spots - that is Arucas. You want to explore a different part of our beautiful island? 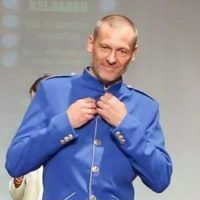 Away from the busy areas and crowds in the south? Then come to Arucas. Head up north and come to this beautiful town, where something that looks like a cathedral meets a famous rum distillery, where you can visit a museum but also walk up a mountain and enjoy marvellous views. 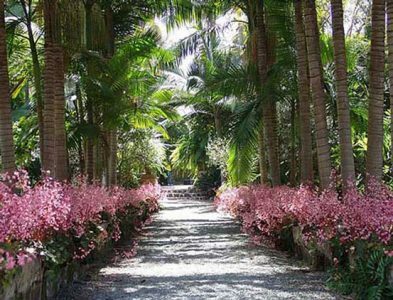 You can even stroll through a park where you will find endemic plants. A beautiful town with approximately 40.000 inhabitants in the north of the island and west of the capital Las Palmas – that is Arucas. After its destruction in 1478 through the spanish conquerers it was rebuilt two years later. Until today crafts like carving, embroidery, lace, building musical instruments or wooden baskets have been alive. You can find all these products still today in the little shops in the city center. Plaza de San Juan and see the impressive church that is often called a cathedral although there is no bishop here so it is actually „only“ a simple church named after John the Baptist. This church is really worth a visit. It was built in the beginning oft he 20th century using Aruca-Basalt which is not only dark but also weatherproof. 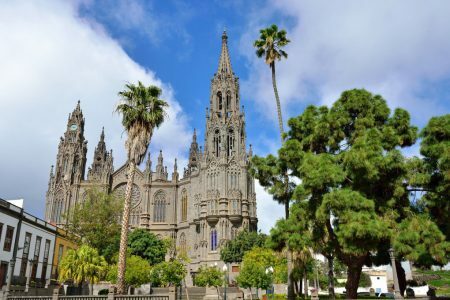 This church has been in many pictures you can find about Gran Canaria – on picture postcards as well as in the internet of course. 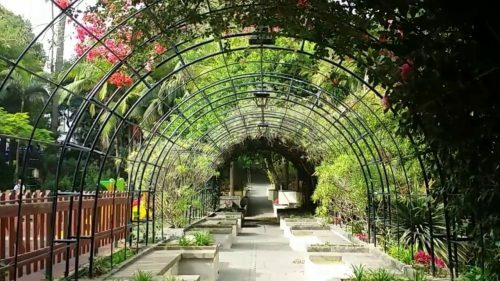 Here in Arucas you will not only find stones though but also plants you won’t see elsewhere – the Parque Municipal is home of many endemic and also exotic plants. Spend some time there and relax in this beautiful place. Parts of that garden have been planned and built like an English garden, others like a French one. Enjoy these 10000 m2 full of nature’s most beautiful species. This is not the only garden you can find here. Another really recommendable one is the Jardin de la Marquesa, built on terraces on the foot of the mountain of Arucas. It contains more than 500 different plants, among them many palm trees. As almost every town also Arucas has its own little museum where you can inform yourself about the past and how Arucas has become what it is today. In this beautiful old house on the Plaza de la Constitución you find a very interesting exhibition about the history of the town,including artefacts like sculptures. 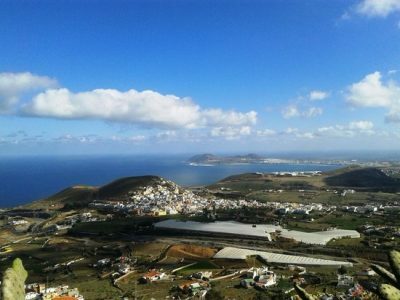 And even a little „mountain“ is here – we have mentioned it already, the „Montaña de Arucas“, a little vulcanic mountain provides you with a fantastic view of the area and you can even see Las Palmas. Walking up this hill will reward you not only with these breathtaking view but also protect you from starving, since there is a restaurant up there. 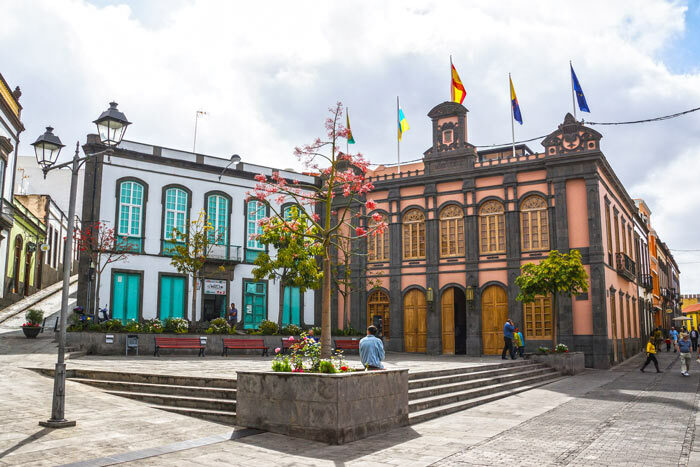 Even before the Spanish conquerers arrived on the island, the town was an important part of Gran Canaria but it became rich by producing red dye from the cochineal and later from sugar cane cultivation. 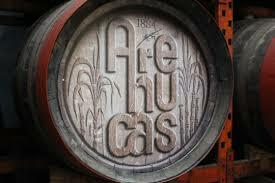 Bananas, fruit and flowers followed and until today Arucas is world famous for its rum called Arehucas. In the late 19th century the production of rum meant work for the people of the area and that was of course very welcome. The Destileria Arehucas is open for visitors so make sure to reserve some time on your schedule for a tour through this interesting place. Some of the oak barrels bear the signature of former famous visitors like the King of Spain, Julio Iglesias, Plácido Domingo, Anatoli Karpow, Willy Brandt or Walter Scheel. On the premises of the distillery you can also find a little chapel calles „Ermita de San Pedro“. Both the distillery itself as well as this chapel are well worth a visit. 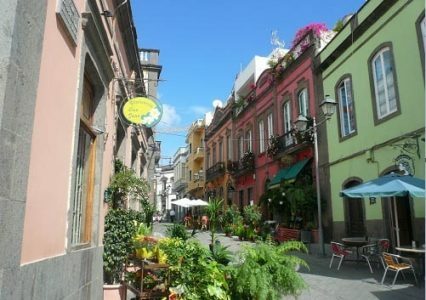 Since Gran Canaria has a very good public transport system, you can easily get to Arucas from Las Palmas. The buses 205, 206 and 210 will get you there. They all start at the main bus station at San Telmo (Triana). Here you find more detailed information. You want to be independent and explore the island on your own, whenever you want? Well, you can always rent a car at AVAL Rent a car Maspalomas and go there by yourself. Just take the road GC-1 from Maspalomas up to Las Palmas , the GC-2 from Las Palmas and then turn left and follow the signs to the town by taking GC-20.